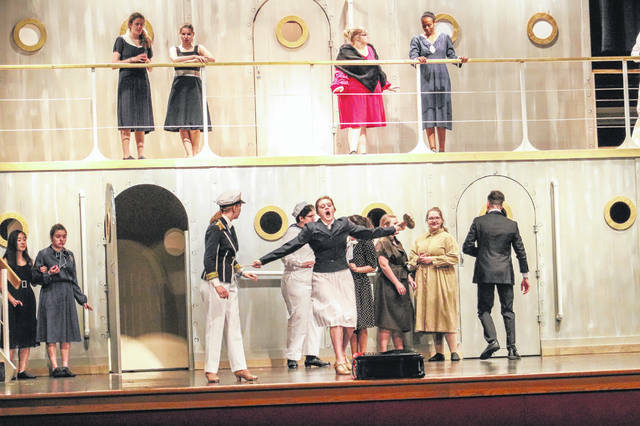 The Purser, portrayed by Grace Hoellrich, center, tells the Captain, portrayed by Camryn Smith, left, that there aren’t enough celebrities on their ship, the S.S. American, during a dress rehearsal Thursday night of “Anything Goes” at Sidney High School. 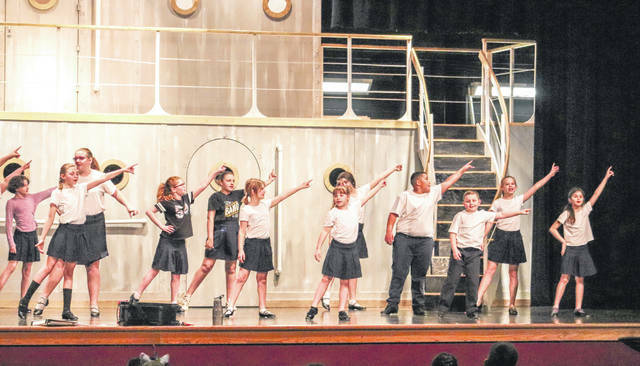 Sidney City Schools elementary school students practice their roles in the high school production of “Anything Goes” Thursday night. Cast members — with the character listed first — in order of appearance are Elisha J. Whitney, Alijah Jackson; Freda, Nickaylee Hastings; Billy Crocker, Colin Freistuhler; Reno Sweeney, Delaney Wilson; Captain, Camryn Smith; Purser, Grace Hoellrich; Reporter, Kayla Smith; Photographer, Whitney Petty; Bishop, Henry T. Dobson Adrian Johnson; Purity (Angel), Savanah Koester; Charity (Angel), Mallory Godwin; Chastity (Angel), Elizabeth Shaw; Virtue (Angel), Tiffany Behr; Ruth, Korah Hudson; Esther, Hailey New; Mrs. Evangeline, Harcourt Elizabeth Allenbaugh; Hope Harcourt, Sara Gibsonl Sir Evelyn, Oakleigh Caleb Johnson, FBI Agent No. 1, Madison New; FBI Agent No. 2, Evelyn Schwepe, Erma, Jenna Allen; Moonface Martin, Anthony Kellner; Sailor Quartet Bass, Caleb Johnson; Sailor Quartet Lead, Jordan McNeal; Sailor Quartet Baritone, Jay Sherman; Sailor Quartet Tenor, Jomari Batusin; Passenger No. 1, Kelly Curlis; Passenger No. 2, Chloe Whalen; Sailor No. 1, Jomari Batusin; Sailor No. 2, Jay Sherman; Lady In Wheelchair, Ella Egan; De-Lovely Featured Partner, Jay Sherman; De-Lovely Featured Partner, Mariana Kellner; De-Lovely Featured Partner, Anthony Kellner; and De-Lovely Featured Partner, Faith Clinton. High school students portraying sailors are Julian Barga, Jomari Batusin, Ian Bonifas, Cody Carr, Ella Egan, Emily Guinther, Nickaylee Hastings, Cora Hernandez, Alijah Jackson, Merzades Jelks, Caleb Johnson, Marley Jones, Amaya Matlock, Jordan McNeal, Julia Plotner, Fatoumata Sao, Jay Sherman and Blake Steenrod. High schol students portraying passengers are Alexis Bailey, Saylor Baum, Kati Butts, Natalie Calhoun, Alyssa Chavez, Kelly Curlis, Ashlyn Figuracion, Allison Fultz, Olivia Harger, Jenesis Jones, Kylie Jones, Meredith Martin, Moka Matsuura, Hailey Neves, Madison New, McKenna O’Donnell, Shannon O’Donnell, Whitney Petty, Maliyah Pleasant, Marta Rodriguez, Evelyn Schwepe, Kayla Smith, Kaitlyn Smith, Rachel Trudeau, Gina Vestal and Chloe Whalen. Elementary school students portraying sailors are Aubrey Beagle, Autumn Bennel, Benji Karl Breinich, Olivia Breinich, Alyssa Cline, Conor Hanke, Makayla Hucklebee, Molly Keiser, Kara Kellner, Abby Kies, Cora Koltak, Addison Lambert, Ady Luginbill, Vedanta Maladkar, Jasiah McKlusky, Ivy Roberts, Zoey Simindinger, Shyla Stiffler, Marlon Tucker and Mason Winkleman. Performances are planned for Thursday, April 4, at 7 p.m.; Friday, April 5, at 7 p.m.; Saturday, April 6, at 7 p.m.; and Sunday, April 7, at 2 p.m. All performances take place in the Sidney High School Auditorium. The stage manager for the musical is Lacie Shaw. The assistant stage manager is Nathan Johnson. The set designer is Brian Johnson. The set builders Chad Allen, Nathan Johnson, Mike Gibson, Caleb Johnson, Colin Freistuhler, Conley New and Nancy Shreves. The set painter is Nicki New. The lighting designer is Conley New. Other members of the production are tech crew Alissa Deakle, Mia Fogt, Kate Miller, Juan Loaiza, Makayla Carr, Kazlynn Douglas, Sara Gumbert, Mallory Hoskins amd Katy Leonard. The costume chair is Tina Allen and providing costumes are Donna Kinkle, Julie Gibson, Andrea Steenrod, Lehman High School and The Sidney Dance Company. Advertising and sponsor sales leader is Stephanie Wilson. Makeup and hair designs were created by Ann Allenbaugh and Amy Breinich. The Music Booster volunteer voordinator is Stephanie Wilson. Tech week meals coordinator is Liz Schroyer. Tech week food donations were provided by Danon and Freshway. Ticket sales coordinators are Tammi Johnson and Julie Gibson. Volunteers for the production include family and friends. The director/orchestra conductor is John Young. Assistant director and choreographer is Laney Shaw. The accompanist is Dana Guey. Members of the orchestra are: Reed 1, Teckla Dando; Reed 2, Kaye Humerickhouse, Lucas Finke, Aiden Smith, Brooke Fogt and Abbie Ragan; Reed 3, Stacey Morris and Ayaka Machimura; Reed 4, Molly Venneman; Trumpet, Jonathan Millhouse, Tyler Dotson, Hunter Croft, Lucas Orozco and Izaiah Steenrod; Trombone/Tuba, Bob Schroerlucke, Marco Orozco, Devan Wiford and Levi Steenrod; Percussion, Kendra Krouskop-Smith, Ken Monnier and Addy Payne; Guitar, Mark Schwarzman; Violin, Janet Fu; and Cello/Bass, Lea Baldwin and Jenny Barnes. Presale ticket prices are $12, all reserved seats; $10, general adult; and $8, general student/senior. Tickets at the door $12, all reserved seats; $10- all general admission. To purchase tickets online, visit https://www.brownpapertickets.com/event/4097066.